The Vivo V15 Pro is set to launch in India on February 20, 2019. 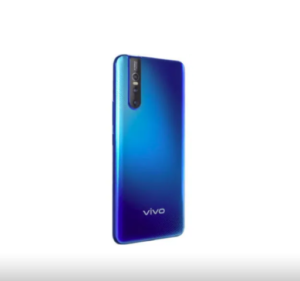 However, before even Vivo officially unveils its newest V Series smartphone, rendered images of the device has surfaced to show its key features. 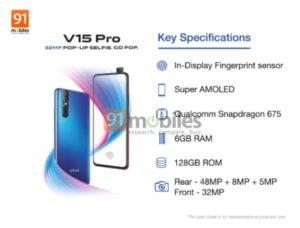 91mobiles shared its exclusive information about the V15 Pro. Some of the highlight specs on this Vivo device are the pop-up front camera, all-screen display, and on-screen fingerprint sensor. The rear of the V15 Pro features a glossy gradient finish. At the upper left corner, the triple camera setup sits on a vertical strip along with an LED flash. The rear cameras include 48MP, 8MP, and 5MP sensors with Super Autofocus capabilities. There’s no physical fingerprint sensor found at the back, so we can assume that this Vivo model will carry on-screen fingerprint unlocking feature. In front, the Vivo V15 Pro is reported to flaunt an all-screen, bezel-less Super AMOLED display. 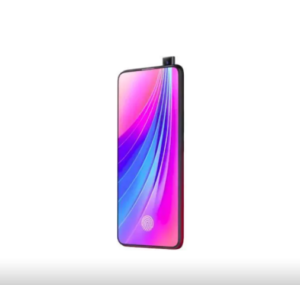 Since there’s no space on the display for a front camera, the handset uses a pop-up setup for the 32-megapixel selfie snapper. Running this smartphone is a Qualcomm Snapdragon 675 with Adreno 612 graphics. This device may ship with a 6GB RAM and 128GB ROM.